The Rheoline Mini MDR Lite is a compact and lightweight take on our existing Rheoline MDR, complete with an identical sealed die configuration, that renders the instrument fully compatible with other sealed die systems in the market. This easy-to-operate, entry-level instrument conforms to international standards, delivering accurate and reliable results fast, as well as optimising space and instrument footprint, making this the perfect selection for small to medium rubber testing laboratories. The Mini MDR Lite comes complete with an integrated temperature control that is the best in its class, and with a 3 term PID control algorithm, this instrument gives accuracy better than ± 0.03 °C. This instrument is equipped with our Labline Lite acquisition software that enables a maximum 10 data calculation for a given test specification and grants a quick pass or fail response for each test. 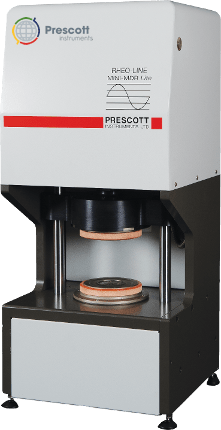 Prescott Instruments have developed a natural synergy of our Mini Moving Die Rheometer Lite and Rheoline Auto-Test to produce a cost effective and well sought after product in the market. In addition, programmable temperature zones and/or a pressure module are also available as an optional extra. Contact us for more details. As our commitment to you, our Rheoline Mini MDR Lite is fully equipped with everything you need to perform accurate and efficient elastomeric compound testing. The provided PC comes pre-installed and calibrated with our most advanced data acquisition and analysis Labline Lite software. Our Mini MDR Lite is supplied with the latest computer hardware, pre-installed with our most innovative data acquisition and analysis Labline Lite software for Microsoft Windows ® OS, providing all standard Rheometry needs. The Lite version permits a maximum of 10 test points for a given test specification and is complete with a calibration module.